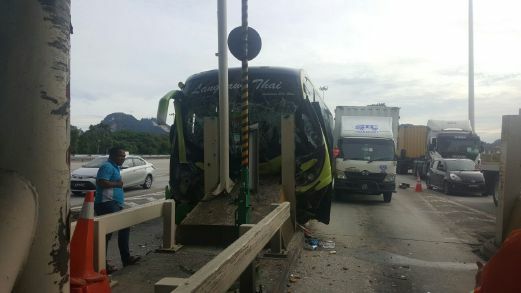 At least 10 pupils and teachers from SRJKC Jit Sin, Bukit Mertajam, Penang were injured when the bus they were travelling in, rammed into one of the toll booth’s divider at the Ipoh (South) Toll Plaza here today. In the 5pm incident, the bus carrying 33 pupils and four teachers were on their way back to Penang from a school trip to Malacca and the Cameron Highlands. At least 10 pupils and teachers from SRJKC Jit Sin, Bukit Mertajam, Penang were injured when the bus they were travelling in, rammed into one of the toll booth’s divider at the Ipoh (South) Toll Plaza here today. In the 5pm incident, the bus carrying 33 pupils and four teachers were on their way back to Penang from a school trip to Malacca and the Cameron Highlands. The accident could have worse outcome, consider the same bus was driving to/from Cameron Highlands mountainous roads. A teacher, Ng Kim Pee, 56, said she was so shocked when the bus driver suddenly screamed, exclaiming that the brake was not functioning. “The driver was in a state of panic before he rammed into the divider. I did not manage to tell my pupils to be prepared as the incident happened so fast,” she said. Before we conclude this as just another unavoidable accident, investigation should be launched to see if the bus was sent for routine maintenance.